Sitting down to work on an embroidery project only to have your machine not stitch is extremely frustrating. This is a guide about what to do when a Singer embroidery sewing machine keeps freezing up. I have a Singer embroidery machine and it won't sew anymore. It will go a few stitches and then freeze up. When I manually turn the wheel it will turn easily for about half a turn and then it gets very hard to turn. I can turn it, but only with a lot of strength. It feels like something is binding it up, but I don't know what. I took it apart and cleaned out all the loose threads and it didn't make a difference. It is still under warranty so I want to know if this is a simple fix or if I should contact Singer. Have you tried a 'shock' reboot? To do one, you turn the machine on, set a programme and try to sew a little, then pull the power cord connection from the mains power point. Wait five full minutes then reconnect. If that doesn't solve your issue then yes, it's defo time for a visit to the factory trained repair tech! 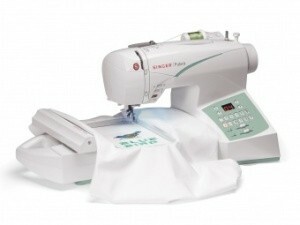 Contact Singer for a certified sewing centre in your area to take the machine to for repair. Be sure to keep a copy of the emails or snail-mail letters to/from Singer to maintain your warranty. Singer will either direct you to check your owner manual for a list of certified repair centres, or will send you the contact details of their preferred warranty service provider closest to you. It's important to go through Singer for this information in case the preferred/acceptable centres have changed since your manual was printed. If Singer directs you to your owner manual you can feel assured the centre is still on their approved provider list.